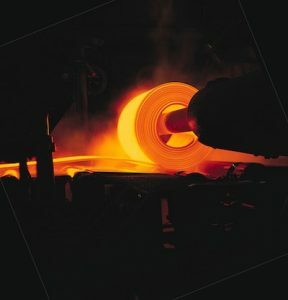 Much of the equipment used to manufacture steel is massive and when this equipment is in operation, heavy impacts (shock) and vibrations are generated. The equipment is often operated 24 hours a day, 7 days a week, and shutdown for repairs results in reduced production and increased cost. There are many applications in steel mills where Fabreeka pad is used to protect equipment, structure and foundations from damage by impact shock and vibration. The design and installation of Fabreeka pad greatly reduces fatigue of metal parts and deterioration of concrete supporting structures, thus lengthening their service life and reducing downtime and cost of maintenance. Fabreeka pad is currently used as a bumper to reduce impact shock on cold bar shears, mill tables and coil drops where steel ingots or coils of steel are handled and dropped, creating large forces and stresses within the equipment. Fabreeka pads have also successfully replaced coil springs on ingot buggies and hot metal cars providing the necessary cushioning in the journal box area of the equipment. Fabreeka engineers work closely with consultants who specialize in steel mill production to provide shock and vibration solutions for equipment within the steel manufacturing process.